Over on the Unproduced Scripts page there are nearly sixty original scripts up for your reading pleasure. Permalink | Comments Off on Original Scripts are up! Babz Buzz The Anniversary Edition. This is the first anniversary of Babz Buzz on SimplyScripts. Obviously, I want to thank Babz and Michael for allowing SimplyScripts to distribute this excellent podcast. I also want to thank all the folks who have listened, enjoyed and commented on the podcast. Your feedback very much fuels the topics and energizes Babz to continue. Some of you may remember Jason Henderson. He was on SimplyScripts Radio last year. The second in his Alex Van Helsing series comes out today on July 26th. In the mean time, Jason is hosting a live podcast with comic writers Drew Edwards and Tony Salvaggio on the Castle Dracula Podcast on Monday, June 27th at 10:30 edt. You can listen in and toward the end of the hour, they’ll open it up for questions. You can check out more info on Jason Henderson and the Alex Van Helsing series on the Harper Collins website. A man has his beliefs put to the test when he is confronted with an offer he simply can’t refuse. View the script here (pdf format). Say nice things to Cameron about his script here. Comment on the film here. In this special edition, the panel talks to Discussion Board member Brett Martin, who attended the Great American Pitchfest on June 3rd-5th. The panel consisted of host Jeff Bush, Pia, Michael Cornetto and (briefly) Jordan Weibe. Writer Bio: Husband and wife writing team Aimee Parrott and Antonio Gangemi met on a train platform in Boston in 2003. It was raining cats and dogs, the mood was perfect. They soon discovered that they’d grown up watching the same old movies. Tony had already written one screenplay and Aimee was writing film reviews and working on a novel. It wasn’t long before they decided to move to Southern California to pursue a career in screenwriting. No, they do not miss the snow and cold. Their neo-noir short, Among Thieves, was produced by Sneakonthelot.com. Their feature-length comedy, Fight Belle, which was discovered on Simply Scripts, is in pre-production with Integral Pictures. In addition, they have three other independent features (The Complex, Used Car Joey and Man & Wife) in development. 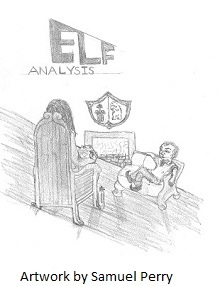 Elf-Analysis is a Christmas comedy that begins in the heart of Boston and travels north. Far north. While Tony and Aimee have never been to Santa’s workshop, they’ve often wondered what an elf would make of a Rorschach blot. Entries (RSS) and Comments (RSS) | 64 queries. 0.202 seconds.